Please refer to our stock # sc1 when inquiring. 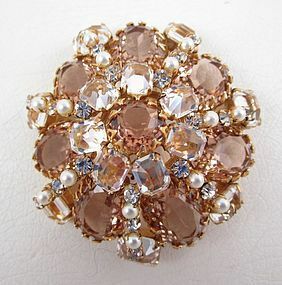 This lovely rhinestone pin was made by Schreiner of New York, and has the company's typical layered construction. It is 2 1/2" in diameter and stands approximately 1" tall. It has oval topaz stones in dog tooth bezels surrounded by inverted crystals and pearls. It has a gold tone setting and it is signed "Schreiner New York" on the reverse. It is in excellent condition.